Consumers spend an enormous amount of time on mobile, particularly with chat and messenger apps, such as Line, WhatsApp and Facebook Messenger. This represents a huge business opportunity for marketers, who must figure out how to leverage messenger services and add the in-app channel into their cross-device campaigns. eMarketer forecasted that in-app advertising spending would outpace mobile web spending nearly 3 to 1 this year. Juniper Research predicts that, by 2018, it’ll reach $17 billion, making in-app the fastest-growing sector of the mobile advertising market. Engaging with consumers in-app is incredibly effective, as it speaks to people in the moment in which they’ve already expressed intent. 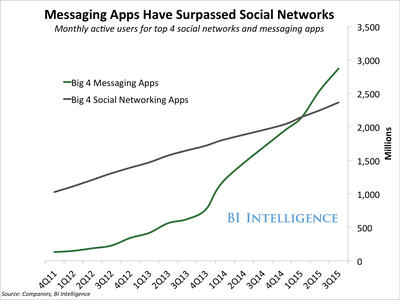 2018 is expected to be another landmark year for mobile messaging apps. More than 1.4 billion consumers worldwide are expected to use a mobile messaging app this year. In 2018, that number will reach 2 billion, according to estimates from eMarketer’s first global report on the apps’ reach. Double-digit growth in the number of mobile messaging users is projected through 2018, as more consumers gain mobile internet access worldwide and flock to messaging apps as cheaper alternatives to SMS, MMS and voice calls. As outlined in a new eMarketer report, “Mobile Messaging Apps: Global User Forecast, Leaderboard and Outlook on Monetization,” by the end of 2015, 75% of smartphone users worldwide will use an over-the-top (OTT) mobile messaging app at least once a month. Such a large share is not surprising, considering smartphones are communication devices at their core and “messaging” has consistently been among the most popular mobile activities, albeit one traditionally done via SMS/MMS. For reasons ranging from cost savings to creative expression, OTT messaging apps have grown incredibly popular with mobile users the world over. With the popularity of mobile messaging apps continuing to grow, the volume of instant messages (IMs) sent annually is expected to eclipse other forms of digital messages. According to a July 2015 press release from Juniper Research, more than 94 trillion digital messages will be sent worldwide this year, a total that includes email, IM, MMS, SMS and social media. Email is expected to generate the largest share of messages, but Juniper contends that the scales will tip in favor of IM next year. The research firm projects the volume of IM will exceed email for the first time by mid-2016 and generate the largest share of digital messages sent annually. Looking ahead, 2018 is expected to be another landmark year for mobile app messaging. At that point, eMarketer projects the number of chat app users will reach 2 billion and represent more than 80% of smartphone users worldwide. It’s premature to rank the leading messaging apps by revenue, as the apps vary widely in their stage of development—some have not even attempted to monetize their audience yet—and their philosophies on monetization differ. WeChat and Line are often held up as role models for successfully tapping into a combination of these sources to generate revenue. Digital content sales—the sale of games and emoji/sticker packs in particular—have been important drivers of revenue for both companies. Stickers alone provide two streams of revenue: one through the retail sale of sticker packs sold by the app itself, and the other from “branded stickers,” a form of brand-sponsored content. But, as with any emerging type of advertising, there are some questions and real technical challenges ahead. As we move into 2016, in-app will continue to be top of mind for many advertisers and publishers alike.